The name"Shan-Shan" comes from the noise that the bells on the umbrellas make when it rattles. The Kasa Odori(Umbrella dance) is very popular in the eastern part of Tottori Prefecture. According to the legend, an old man named Gorosaku danced with an umbrella for the village god praying for rain during a drought in the Edo period(1603-1867). 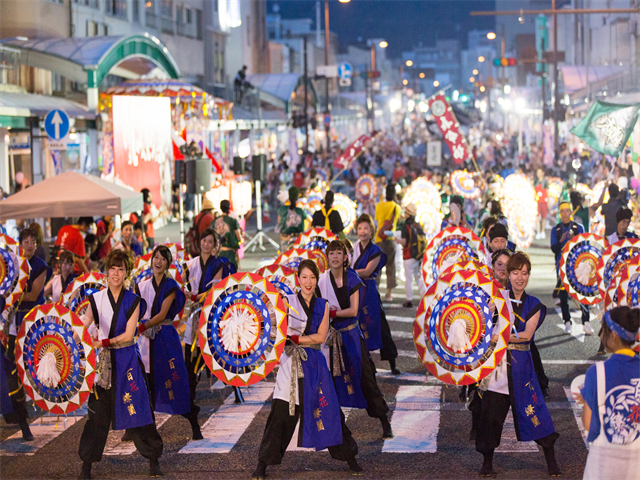 The Kasa Odori is considered as a part of Bon Odori(Japanese dance in Bon festival) as well as Te-Odori( Hand dance). More than 100 groups dance and march on the street. Stage performances are held at Tottori station.